I'm a bit of an Anglophile. Included in that is an interest in Ireland and Scotland, so when I discovered author Cindy Thomson's books I knew I had to "meet" her. She was gracious enough to take time from her busy schedule to answer my questions. I hope you enjoy getting to know her as much as I did. Linda: Cindy, thanks for joining me today. You have two fictional book series. One is set in the 5th Century and the other in the early 1900s. What prompted you to write in such different eras? 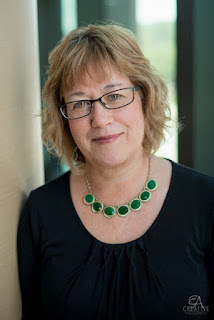 Cindy: My first book is set in ancient Ireland. I had trouble selling any more to publishers so my agent at the time suggested I write about Irish immigrants at Ellis Island. We sold that and then after that I went back to the 5th-6th century. That’s how it happened, but I enjoy history in general. LM: You write fiction and non-fiction. How is the writing process different for each one? Cindy: Fiction for me is more creative. It takes more out of me and takes longer to write. Non-fiction is reporting, hopefully in a story-telling manner. More documentation is required for non-fiction, but since everything I write is history-based, I enjoy it all. Cindy: I’m a pantser who wishes she was more of a planner. I think if I was I wouldn’t write myself into quite as many corners. That has been a learning process for me. I learned that I could not change it, that is how stories come to me, but I also learned that a certain amount of plotting is critical and necessary. My favorite part of the process is after I’ve written the first draft. Getting the story down is hard, but once I have it I love going back and fixing it and making it better. LM: Writing about a different era and culture requires lots of research. What tidbit did you discover during that phase of writing that created an “aha” moment for you? Cindy: There certainly wasn’t just one so I’ll just pick one. 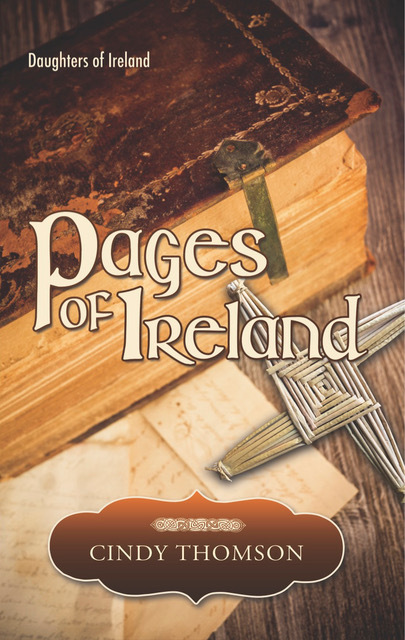 My latest book, Pages of Ireland, is about the value a book had in ancient Ireland. I read about a story that was recorded in the 17th century about a man named Conal Mac Geoghegan of Lismoyne who recorded in the Annals of Clonmacnoise, "I have seen myself part of that book which is at Durrow in the Kings County in the custody of an ignorant man. When sickness came upon cattle, for their remedy put water on the book and suffered it to the rest there a while and saw also cattle return thereby to their former or pristine state and the book to receive no loss." A man dunked the ancient book into a cattle trough! According to The Ancient Books of Ireland by Michael Slavin, The Book of Durrow does show signs of water damage and "a hole in the top right-hand corner of the leaves indicates that they could have been suspended by a thong in the 'cure' process." This “tidbit” led to me writing Pages of Ireland and to include a scene like that. LM: That is fascinating! What’s the quirkiest thing you’ve ever done? Cindy: Ever? I guess you mean in the process of writing a book. When on a research visit to New York City, I attended a cocktail party held at the Police Museum, given by the Irish American Historical Society. There was no cost so I went simply because I was writing about a policeman in NYC in 1900. My husband and I knew no one there and had no idea why were invited or what the purpose was. They were recognizing someone for his contribution to something. But novelists go to all kinds of places in the name of research. Cindy: I am finishing up the third in my Daughters of Ireland series. It should be out by mid-2018. The title is Enya’s Son and like the others in the series it’s based on legends. This one is about St. Columcille and his mother and the quest to hold on to things that enviably will slip away from you, and the discovery of what is really eternal. Cindy: Don’t rush. It’s so easy now to rush to publication, but a professional takes his/her time, researches the industry and the process, and does not cut corners, especially not with editing. Find a writers group. That will be the most valuable thing you do because you can learn so much from other writers and make good contacts. Thanks for having me today, Linda! LM: It has been a pleasure! You can purchase Pages of Ireland on Amazon.